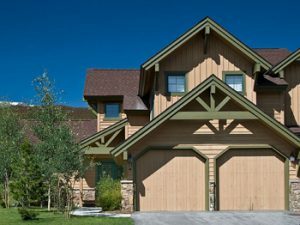 Highland Greens are newer Breckenridge townhomes and duplexes in Breckenridge Real Estate. Located just off Tiger Road near the Highlands at Breckenridge and the Breckenridge Golf Club. Built between 2000 – 2006, there are 100 total residences in Highland Greens. The residences are a make up of 7 – two bedrooms, 80 – three bedrooms and 13 – four bedroom properties, they range in size from 1108 – 2128 square feet. All Highland Greens properties have either a 1 or 2 car garage that is attached to your individual residence. Some of these Breckenridge townhomes have hot tubs on their private decks which is great to relax in after a long day enjoying all the activities Summit County has to offer. One of the best features of owning a townhome or duplex at Highland Greens is the private shuttle that will take you to Breckenridge Main Street or the Breckenridge Ski Resort. If you are looking to golf in the summer or nordic ski and snowshoe in the winter, Highland Greens is a short walk or drive to the Breckenridge Golf Club or Gold Run Nordic Center. Highland Greens properties also feature spectacular Ten Mile Range and Breckenridge Ski Resort views from some of the decks, living rooms and bedrooms. Across the street owners also have access to the Gold Medal waters of the Blue River for fly fishing or an evening stroll along the river.